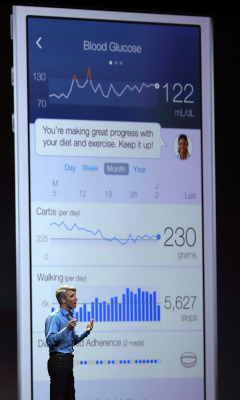 Apple has launched a new health platform called HealthKit. The announcement came at the company's annual Developers Conference in San Francisco today. Digital health is already a crowded field with more than forty thousand health apps and devices monitoring everything from your activity level and sleep to your weight. Apple's new health application will pull in data from third-party apps and consolidate them into one health profile. "For digital health this is a huge move to see the world's largest tech company entering directly into this space," says Malay Gandhi of Rock Health, a San Francisco-based research and start-up incubator. HealthKit, says Gandhi, is an attempt "to clean up a fragmented ecosytem for consumers, as well as solve data-transport issues for the industry." A recent report from Rock Health finds that funding for the mobile health market has doubled in the past year to more than two billion dollars. With HealthKit, Apple is also partnering with healthcare. The company has named the Mayo Clinic and Epic, a giant health record company, as early partners. "This platform really sits between the consumer's view of the world, with all these devices and apps, and the healthcare system, which has all this clinical data that has never really been presented to consumers in a meaningful way," says Gandhi. The new HealthKit could potentially interact with wearable devices like Apple's much-anticipated iWatch.